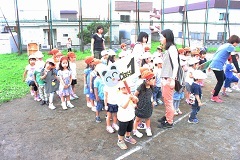 Today’s Class 1 had lots and lots of fun practicing for the Sports Festival at the end of this month. The whole school practiced the entrance and exercise together and the Class 1 children did a fantastic job marching and lining up really nicely. 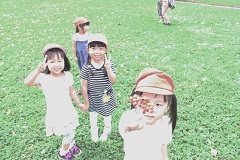 After the practice had finished we played in the park, catching dragonflies and searching for berries. 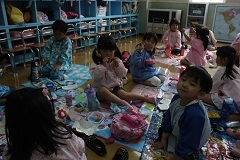 Today was packed lunch day and we enjoyed having a picnic in the classroom before going home. Well done everyone, see some of you tomorrow at Mother’s Support Day! Have a great weekend!